When I first got it in the mail I opened it and read the first six pages and then put it down. A few days later I picked it up and began again – read the first eight pages, then sat it down. Then last night I picked it up and plowed through the first section. For me, it was as if I needed to build momentum by picking it up and putting it down and reading and rereading and rereading the first few pages. But once I got over that initial hump the words pulled me through. This morning I read the last two sections. My overall reaction is very positive. I really had a good time reading Young’s sentences…this is why I come to literature: not for story, but for sentences…and this book delivers. In the first section many of the strongest/strangest sentences come at the end of a crot: “Still, there was more summer in her mouth than he would have known in a wild of work” (pg. 26). “But the room was in her eyes and all the street outside” (pg. 49). Since the genre is not announced, I proceeded to read it as if it were a novel, by which I mean that I read it as though all parts were interconnected. (I have since learned that it is “a collection of microfictions” – but I’m not sure what that means nor how that classification is supposed to inform the reading experience) The way I picture this book in my head is as if the entire story had been painted as a mosaic onto a stained glass window and then the window shattered and Young came and glued the pieces back together. It is broken into three sections: Easter Rabbit, Deep Falls, God not Otherwise. First two sections seem to work together in an interesting and provocative way; third section seems like addendum. First section = urban/city; Second section = rural/forest. There is a “he” and a “she” running throughout (confusion on page 68 when “the three” walked up – not sure who third is?) Question to consider: are these repeated pronouns connected? Is the “she” on page 6 the same as the “she” on page 37? I would say yes. Some evidence: on page 30 she makes a rhyme out of confetti/spaghetti, and then on page 46 she makes a rhyme out of snow/crow. My favorite part of the book is the relationship between page 75 and page 79. 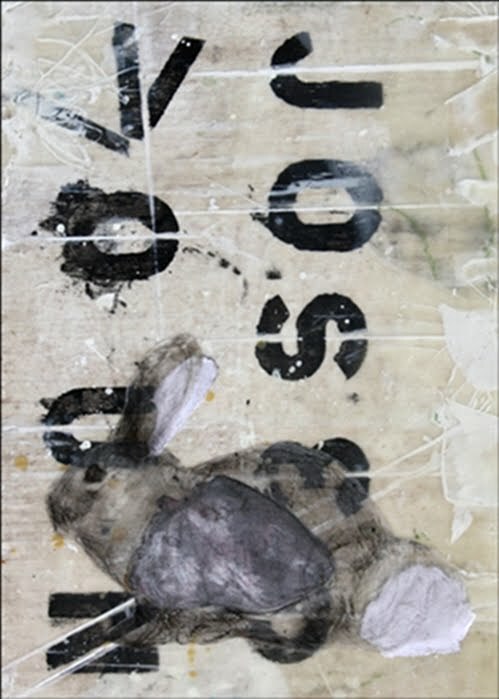 I think there is something extremely telling in that interplay, about the way time works in Easter Rabbit, the way we might approach rereading the book – thinking about connections and redistribution of cause and effect.